The painting was written in 1942. This is one of the paintings, the plot of which the artist called serenades. He wrote several pictures with this name in different years. Picasso is recognized as the most expensive genius of artists. The uniqueness of his paintings amazes and breaks the usual perception of reality. In the life of Picasso there were several periods, under the influence of which he wrote certain plots. The canvas “Serenade” was written in the creative period under the name “Guernica” and pacifism. Guernica is a city that was destroyed by the Nazis during the war. He was a cultural heritage of the Basques. Under the influence of this event, Picasso painted the canvas, which is also called as the hacked city of the Basques. He was seized by the horror of everything that was happening, which was reflected in his work. He turns pictures into broken geometric blocks that are difficult for most people to understand. His canvases are puzzles that only he himself could solve. 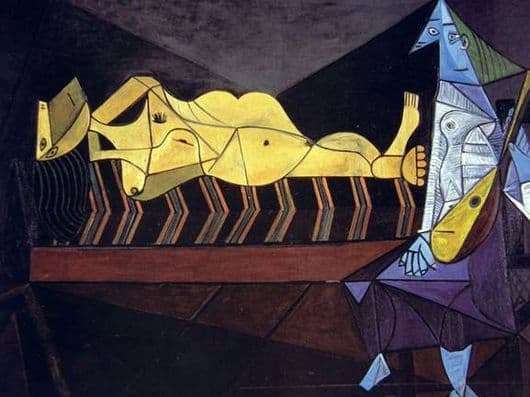 Picasso was considered a woman-hater because he distorted the female body and face beyond recognition. Perhaps this is due to the fact that he could not get along with his first wife, a Russian ballet dancer. Problems in the family and the impact of the war on the psyche of the artist were reflected in his distortion of people, and women in particularly hard forms. He was accused of mocking and hating women. And this is partly true, that can be understood from his canvases. In the picture “Serenade” we see an incomprehensible female figure, broken into geometric pieces, twisted in an incomprehensible pose. The figure of a man is no less mysterious and complex. Around the artist depicted everything in gloomy and dark tones, personifying emptiness and war, which terribly frightened him. His fear and psychological imbalance splashed onto the pictures. Not only canvases, but also Picasso’s sculptures reflected all the tragedy and hopelessness of that time. Picasso created his own individual style of painting, which influenced the impression of the whole world. His paintings are cultural heritage.